First came my obsession with the gigante bean. What to do with it came next. The marinated buttery gigante beans, one of, if not my #1 favorite bean, always lure me into the olive bar at the supermarket. For the life of me I couldn't figure out why you can find them marinated but never for sale, dry, anywhere. 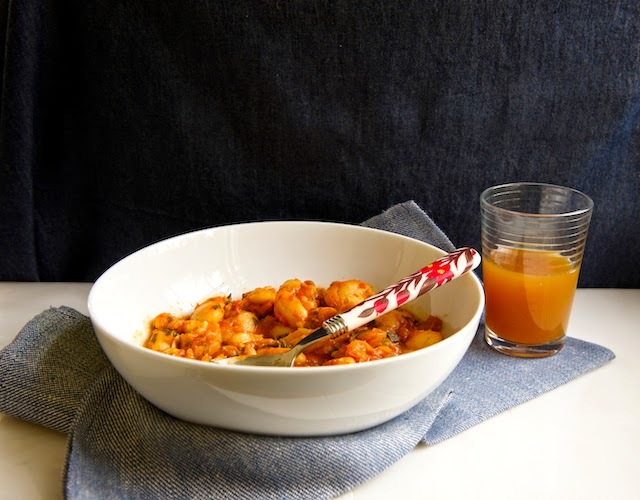 That is until I saw The Washington Post's Greek Giant Bean Stew with Lemon Honey Sauce. Though a fine looking dish, I think perfect as a mezze for a NYE party, I knew I didn't want to make it this weekend, LOL. I wished to make a more substantial tomato sauce based dish. In the process, I found out through the Washington Post that a new Mediterranean grocer, Mediterranean Way, in DuPont Circle, DC, carries the gigante beans. You don't have to coax me twice, I always look for an excuse to get into the city. Little did I know that one of my all time favorite cookbooks, Balkan Cooking by Benny Saida, has the perfect recipe. I do hope someone someday would translate this cookbook from Hebrew to English. I really do. It's such a treasure trove. You might remember this Wintery Balkan Cannelini Stew I made from Saida's cookbook back in February, 2012. The title of the recipe in Hebrew was transliterated 'גיגאנטס פליקי'. It took a moment to sink in, 'Gigante (gigandes) Plaki'. Basically a Greek gigante beans in tomato sauce cooked on the stove and finished off in the oven. The dish is served as an appetizer. There are several ways to make this dish. In Saida's cookbook it's not baked at the end. There are many techniques to cooking the beans in this dish. I like to cook the beans to complete tenderness in water as opposed to half cooking them and finishing them off in the sauce. Reason being, since the beginning of time, I was taught by a North African Israeli friend of mine that beans need to be cooked in a couple batches of clean water to reduce and eliminate flatulence. Maybe an old wives' tale, but I wholeheartedly believe it. The beans soak up the sauce within a very short period of time, slurping the sauce and blushing red from within. If you feel your stew is too watery, feel free to finish it off in a 350F oven for 20 or 30 minutes. I topped it off with a super easy to make sunny side up egg and served it as lunch/brunch today. You can find gigante beans online or at Mediterranean grocers. Soak the Gigante beans in water overnight. Water should be 1-2 inches above the beans. Do not worry if they look wrinkled. They will plump up as they soak up the water. The next morning drain, rinse and add into a pot. Add water 2 inches above the beans and bring to a boil. Reduce the heat to low/medium bubble, stir and cook for two hours or until super tender but the bean shape holds. Stir occasionally throughout the cooking process. In a large sauté pan over medium heat, add the olive oil, onion, garlic, carrot, and either jalapeño or bell pepper. Sauté while occasionally stirring on low/medium heat for about 6-8 minutes until super soft but not caramelized. Add the tomatoes and cook for a few minutes longer. Add the tomato sauce and stock and cook for a few minutes longer. Throughout the cooking process stir occasionally. Add the beans, salt, pepper, parsley and mint and continue cooking on low/medium heat until the sauce thickens and liquids are reduced. In a non-stick frying pan over medium/high heat, add the tablespoon of oil. Once the oil looks like it ripples, crack the egg directly into the pan. Reduce heat to low/medium and continue cooking the egg until the egg white completely settles and has no wobbly parts. If you wish the egg yolk not to be too runny and firm up somewhat, add a lid on top of the frying pan when cooking the egg. For egg over easy flip the egg to cook on the yolk side. Sprinkle with a dash of salt and freshly ground black pepper. 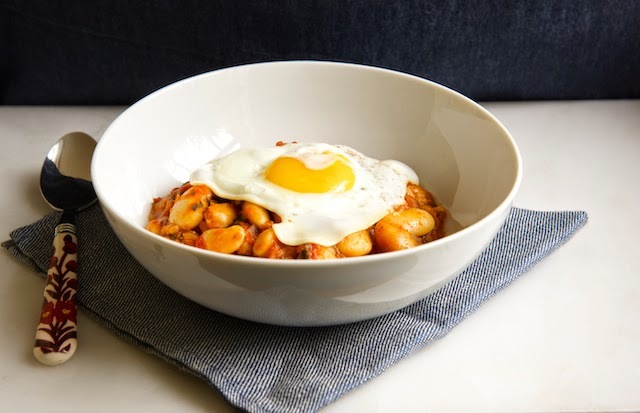 Scoop the sunny side up with a large spatula and serve on top of a bowl of gigante bean stew. Scrumptious, healthy and comforting! A perfect dish. I love gigante beans. Beans beans, the magical fruit, the more you eat, the more you.... oh, you know. I couldn't help it! Wheeeee. 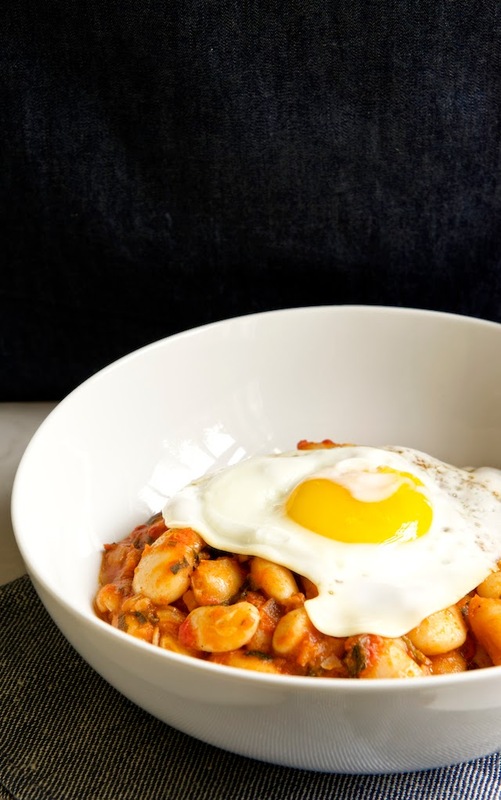 I love all beans and I would love this dish! What a wonderful bowl of comfort food! And that perfectly runny yolk on that egg looks so good right now. Sounds delicious - especially with the egg! Interesting! 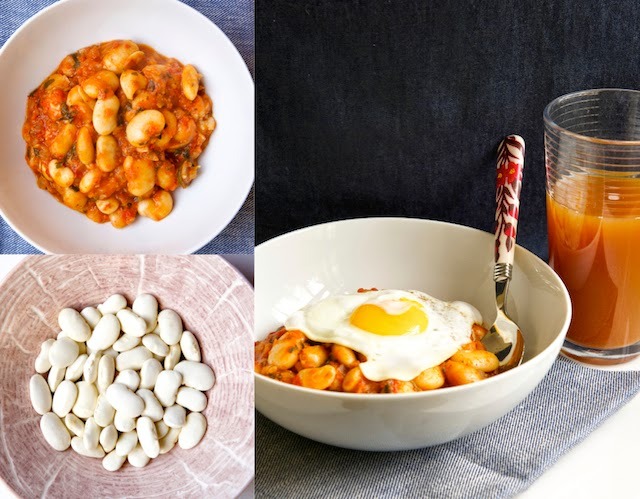 I'd never heard of gigante beans until now (if that sounds absurd - I'm not a bean eater. ;)) I like the egg on top. Looks great! Yum! I'm on the lookout for Gigante Beans! I love beans - and have never had gigante beans! I've got to look for them so I can try this recipe! I love the egg on top! 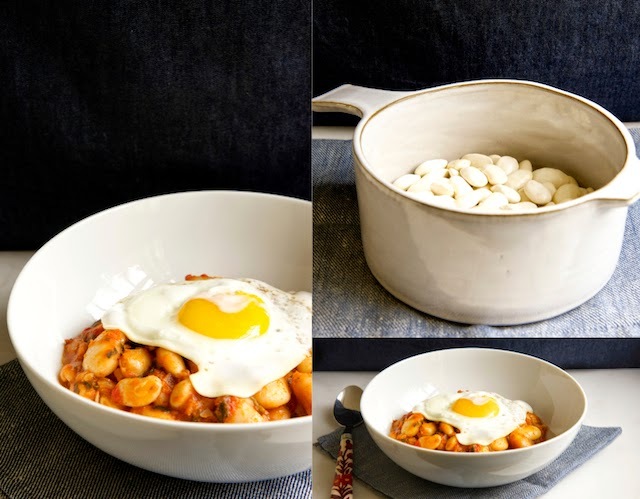 I need some gigante beans in my life topped with that gorgeous egg of course. Corona beans! I found them for the first time in Seattle and became obsessed. This looks like an amazing way to use them.